After looking at her photo, everybody will have to admit that Alejandra definitely deserves a beauty queen tag. Her long hair was transformed thanks to ombre hue and platinum strands. The ensemble has the perfect amount of waves, volume and layers. We heart! How http://v1buyonline.com/ , for the Next Big Mobile App with Overnight. E-mail me when someone replies to this comment. Here is another hairstyle of mine. 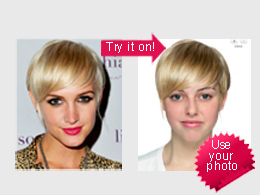 Try on hottest celebrity hairstyles, colors for a brand new you. it's free! Copyright © Prohaircut All rights reserved.